Matte: Selectable. This clip specifies which Source areas to measure the flicker from. If this input is not provided, the Alpha of the Match input is used as the Matte instead. It can be inverted with the Invert Matte parameter. Pressing this button sets the Match Color parameter to the average Match clip color within the Matte at the current frame. It causes the output to equal the Source at this frame. 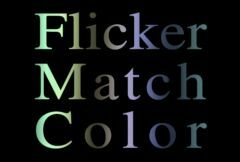 The average Match color in the Matte for which the Source input is unchanged.